The topic does not seems to make any sense but this is how the today’s world is moving forward….without sense…without logic….and without values…. In today’s world….education means a good professional degree…a good job…lots of money and a luxurious life. But, what about values, morals & principles? It is astonishing to see educated people running after materialistic things, cheating, lying & what not. It is this category that I like to call as “Educated Illiterates”. They have all fancy degrees and luxuries around them but the core of their mind is just as illiterate as a rural village man. There have been incidences with people around me…which had forced me to write down something which is not probably taught in Engineering, management and medical colleges. – It is not your CTC that makes you a good person. Real earning is good relationships and a helping attitude towards people around you. – Foundation of successful & happy family lies on family values, understanding & trust not on degrees, luxuries & dowry. – Playing with someone’s emotions is not as easy as playing video games. Always remember there is one supreme power above all of us. Fear GOD for HE will not forgive anyone for any misdeed. This blog is dedicated to all my friends who are too depressed and disappointed by this crowd of “Educated illiterates” around them. 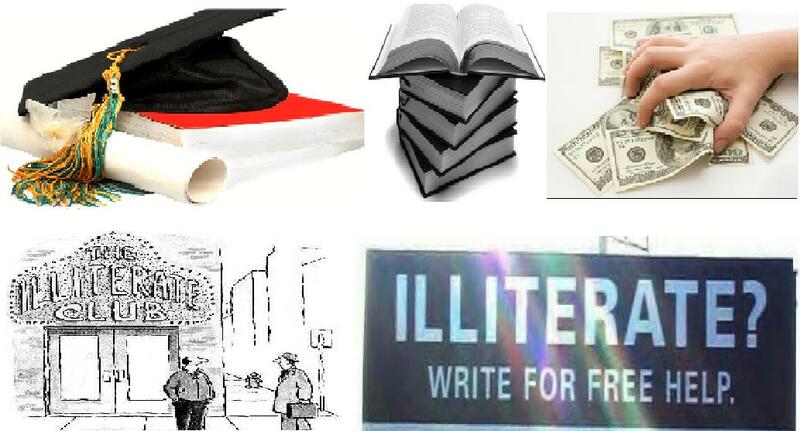 I just request you all that instead of cursing your destiny just pity on these “Educated Illiterates” around you. They are not human beings with feelings, emotions and values. They are just mechanical robots who have been programmed to run after materialistic things and one should not curse his/her life for these mechanical robots. Now, it is really challenging to find in a crowd who’s human and who’s robot? Just have faith in GOD and HE will give you the vision to identify. If you are right, if you follow your values, if you have FAITH IN GOD….& faith in yourself no power in this world can ruin your life. Your success is in your own hands. So, FRIENDS ….BE HAPPY ALWAYS….Its U and only U who can make your life Successful and Happy..!! If you are Human….just spread the message and essence of this blog to robots around you….Ofcourse, this may be a wasteful, small effort but we can at least give it a try. This entry was posted in Thoughts and tagged Dowry, Education, emotions, God, Human, Illiterate, Morals, People, Values by Akanksha. Bookmark the permalink. Vry truly written Akansha! !…i myself face such educated illiterate…sometimes this is vry irritating to accompany them…but what to do they are unfortunately one of our collegues…and talking with them seems to a fake session only…bus this is vry surprising to see person with no values…no truth…no commitment..no standing…they are just like baseless utensils who slant to any side luring them little or cheap benefits.Such guys have lot off “Show Off Attitude” and far away from terms like simplicity…reliability…down to earth…principles….kidness!!! Well said Gaurav….its good 2 know thr r others also who think the way I think…Its true..the world arnd us is full of such ppl now.. The best effort v can do on our end is just to stick to our own principles….and not to bother wat the whole world is doing…. Couldn’t have agreed more with your blog….We need to understand that being successful and being happy are two different things…. Cheers to happiness that has very little to do with materialistic things!!! Nice to see ppl puttin a thought to such serious topic. Well i’d like put it as rather “UNEDUCATED LITERATES” as education is nt about school nd marks it is rather holistic developement of a human being and his ability to understand his surrounding situation and choose the right path ahead. Makes one laugh at such literates who are running after things which they probably don’t understand or want but are just following the crowd. This is disillusionment is very commonplace nowadays and damaging the Social strata of Peoples lives. Time to wake up. A message which every individual should learn and experiment on themselves. It is not about others but also you and me, everyone around has become materialistic. Today the upbringing has changed, parents only teach their child to behave in a certain matter and to discriminate. No wonder where this world is heading to but yes it is a serious situation and high time that people should realize that relationships are more important than anything else. As it is well said that ‘Use Things and Love People, Do not Love Things and Use People’. Only thing that interferes with true learning is my education. The whole idea of teaching in elementary and primary schools is to creat morons who can follow instructions written greater idiots. couldn’t agree more with all of You. Keep Learning!!! Its very true, Akanksha. But take it positively, don’t get irritated. I would say it is one kind of litmus test that God conducts to see how stable u r in your life by providing such “EDUCATED ILLITERATES” around you. I think it ‘s not sufficient to just write your comments here. One has to really workout the root cause and build our next generation eucated in all senses. We can surely try 2 set an example…but majority wins & tat is of robotic ppl unfortunately.However, v shud try our best 2 set our own path, to set an example but at the same time it is equally necessary to try our effort on changing those robots around us bak 2 humans. However, it could seem improved if you fix all the grammar issues. Thanks for stopping by & supporting my views..